Here we will show you how to activate & generate PIN for your new HDFC debit card through ATM using OTP (Green PIN). After getting HDFC welcome kit (Debit card, Cheque Book), first you need to activate and generate pin for your new debit card. 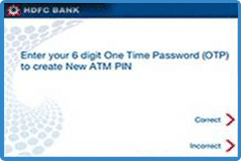 Active debit card and PIN required to enable mobile banking and net banking online. To get PIN for your new card you have two options. Without wasting your time for physical pin, Follow this step by step process and generate PIN for your debit card at HDFC ATM. Note: If you have received the Welcome Kit at your registered address, you will receive a Green PIN (OTP-One Time Password) via an SMS. This OTP is valid for a month, within this period you need to visit HDFC ATM to set your pin. 1: Visit HDFC ATM machine, swipe your card. 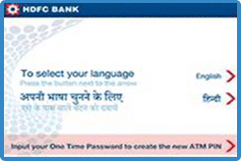 2: At the bottom of the Language Selection screen, you can see – “Input Your One Time Password to create new ATM PIN” select this option. 3: Now Input your One Time Password (green pin) received on your mobile number. 4: Re-enter the One Time Password(OTP) to confirm. 5: Next screen, Input your registered mobile number. 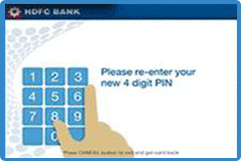 6: In next screen, Enter a 4 digit PIN number of your choice & verify. You will get a transaction receipt confirming successful PIN change. You have successfully set your PIN for HDFC debit card. Now you can register for mobile banking and net banking online. 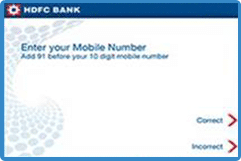 How to register for HDFC net banking online?